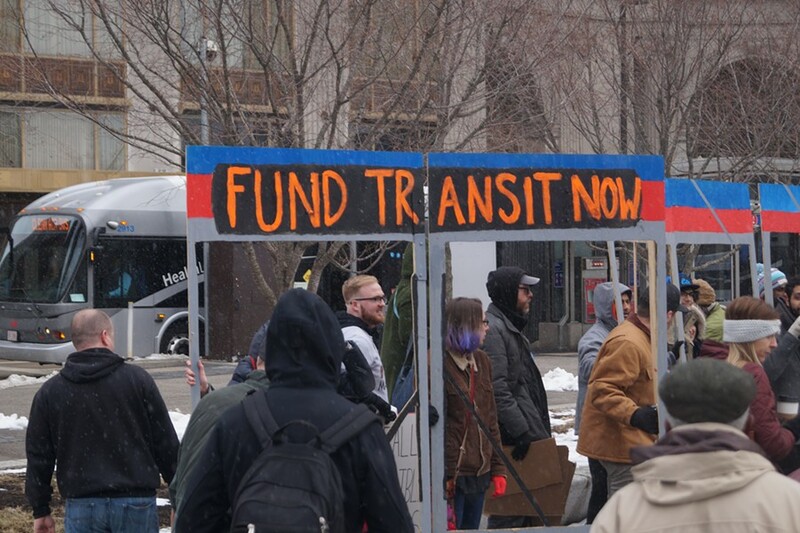 The transportation advocacy group Clevelanders for Public Transit will rally Monday evening to demand increased funding for Cleveland's ailing RTA. The group will meet at RTA HQ on W. 6th Street at 5 p.m. and will march to Public Square, where the rally will begin at 5:30. At the top of the coalition's priority list is calling on the RTA board to place a levy on the November ballot. The levy would fill a critical funding gap, CPT said, and forestall further fare hikes and service cuts. "RTA is losing $20 million per year due to a change in state sales tax collections, which will result in significant service cuts to an already inadequate and shrinking system," CPT said in a press release announcing the rally. "In order to reestablish public trust and reform the organization, CPT is calling for the levy to be renewable after five years." Additionally, CPT is calling for the RTA board to begin the search for CEO/GM Joe Calabrese's replacement now. Calabrese has said that he will retire in 2020, and CPT says that starting the search early will provide more time to find a qualified successor and will "allow a rapid transition to new leadership with minimal disruption" upon Calabrese's exit. When Scene asked Budish about whether or not he'd considered CPT's request last month — he has yet to appoint a replacement for former East Cleveland Mayor Gary Norton, whose term expired in March — a spokesperson would not directly answer. To multiple emailed questions on the topic, all a spokesperson said was that Budish was "considering appointments for a few boards, including RTA." But the current appointment of an RTA rider should be merely the beginning of a renewed commitment to the responsibilities of the RTA board. "Going forward, Cleveland Mayor Jackson, County Executive Budish, and the Mayors and Managers Association must place significant emphasis on future appointments to the Board of Trustees," CPT said in its release. "Appointees should include daily RTA riders as well as experts in rail and bus operation, finance and budget, land use, real-estate law and environmental sustainability. This will allow the Board of Trustees to make better informed decisions, rather than approving staff recommendations."